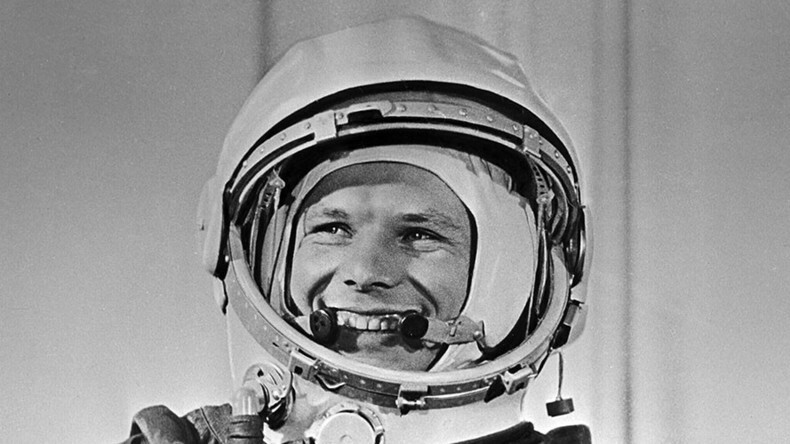 The Sun was born in the battle between the inward pull of gravity and the outward pressure of radiation. Neither opponent won the struggle, for the victory is in balancing the forces. Gravity held the new star together. The fusion of hydrogen into helium provided the energy whose outward force held off collapse. Our Sun isn't unchanging, nonetheless it has maintained this balance for over four and a half billion years. Along with most of the stars that we see in the night sky, the Sun is a main sequence star, burning hydrogen in its core. This isn't burning as coal burns, which is a chemical reaction. Hydrogen burning is a nuclear reaction in which four hydrogen nuclei join to make one helium nucleus. A helium nucleus has less mass than four hydrogen nuclei, because some of the mass is turned into energy in the reaction. Einstein's famous equation E = mc2 tells us how much energy. It's the amount of mass times the speed of light squared. That is a lot of energy. Yet the Sun's hydrogen won't last forever. What happens then? When the hydrogen in the core is used up, nuclear reactions stop. There's no radiation pressure to balance the pull of gravity anymore. The core starts to shrink. This is the end of the main sequence, but it's not the end of the star. Gravitational collapse releases considerable heat - that's how the baby Sun got hot enough to start nuclear fusion in the first place all those billions of years ago. (See the article “Starbirth”.) 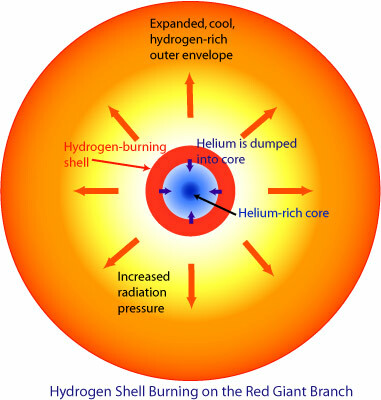 And as the core collapses, it will provide enough heat to start shell hydrogen burning. The shell layer is the layer of the Sun just outside the core. The Sun that we know now is classified as a yellow dwarf. When it leaves the main sequence, its core will get smaller and denser, but its outer layers will expand due to the radiation pressure from the shell burning. Its larger size will make it brighter. Yet its temperature will drop because the energy is spread out over a bigger surface area. It will become a red giant. Mercury and Venus will be swallowed up by the expanding Sun. The Earth may remain, but life will not, for the seas will boil away and the crust will melt. When the collapsing core gets hot enough, there will be a sudden burst of energy called a helium flash. Helium fusion in the core will then start to produce carbon and oxygen. This releases more energy than hydrogen fusion, so a new balance is reached between the radiation of the hotter core and the gravity of the larger star. The helium-burning Sun will swell up even more, extending to the current orbit of Mars. Helium burning will last for around 100 million years - nothing like the billions of years of hydrogen burning. But the carbon in your body, and the oxygen you're breathing originally came from a red giant star that died long ago. When the helium is gone, core collapse begins again. The Sun isn't massive enough to get to the temperature needed for carbon burning, so this is pretty much the end. Yet it isn't quite the end of the story. There are many visible reminders of the final stages of a star like the Sun. The most spectacular is the formation of a planetary nebula. The red giant's core collapses into a small sphere, but the outer layers are ejected as the gravitational pull of the core loosens its hold on these distant layers. Other factors, such as the star's chemistry and its magnetic field, form the gas into rings or various amazing shapes. The nebula glows because it's energized by the heat of the collapsing core. 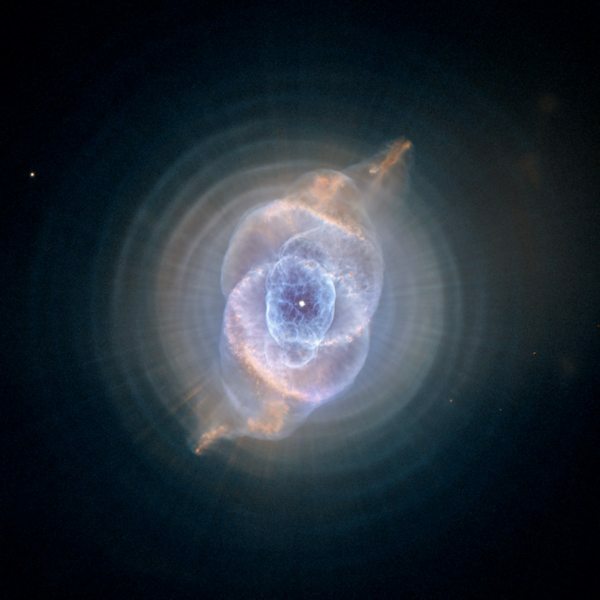 A planetary nebula has nothing to do with planets. Seeing some of these nebulae through his telescope, eighteenth-century astronomer William Herschel saw a disk rather like those of planets, and the name stuck. But what of the shrunken core? It has no nuclear reactions to support it against gravity, yet it doesn't collapse into nothing. It forms a remnant known as a white dwarf. Although having the mass of a star, it's not much bigger than the Earth. 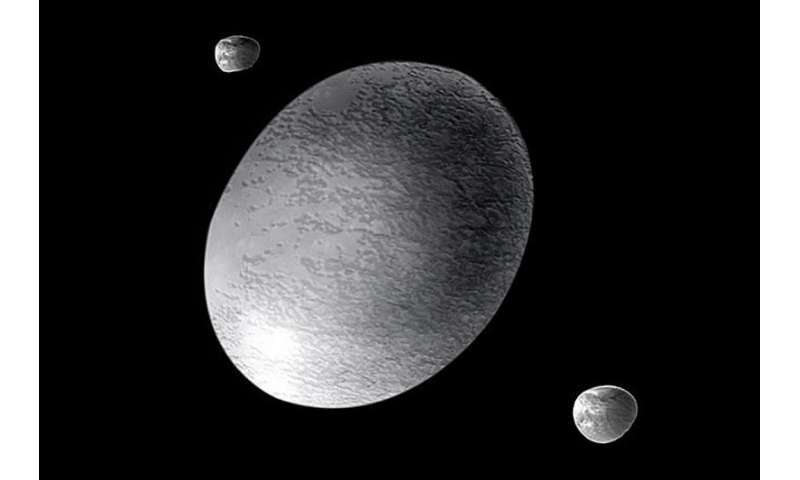 Ordinary matter can't be compressed to this extent, but a white dwarf is made of exotic matter not seen on Earth. If you could collect a teaspoonful of it, it would weigh about fifteen tons. When the Sun is a white dwarf, it will be made of carbon and oxygen and degenerate electrons. It's the electrons in this unusual state that support the white dwarf against further collapse. In the collapsed star, gravity's attempt to crush them ever closer is resisted by an outward pressure called electron degeneracy pressure. This eventually does the job when there are no nuclear reactions to resist gravity's pull. Although the white dwarf won't be generating heat, it's initially very hot from the gravitational collapse - that's why it's white. After that there will be nothing more to do except cool. When it's radiated away all of its heat energy, what's left will be a cold, dark sphere of carbon, oxygen and degenerate electrons. However white dwarfs cool so slowly that the Universe isn't old enough for any of them yet to have become black dwarfs. 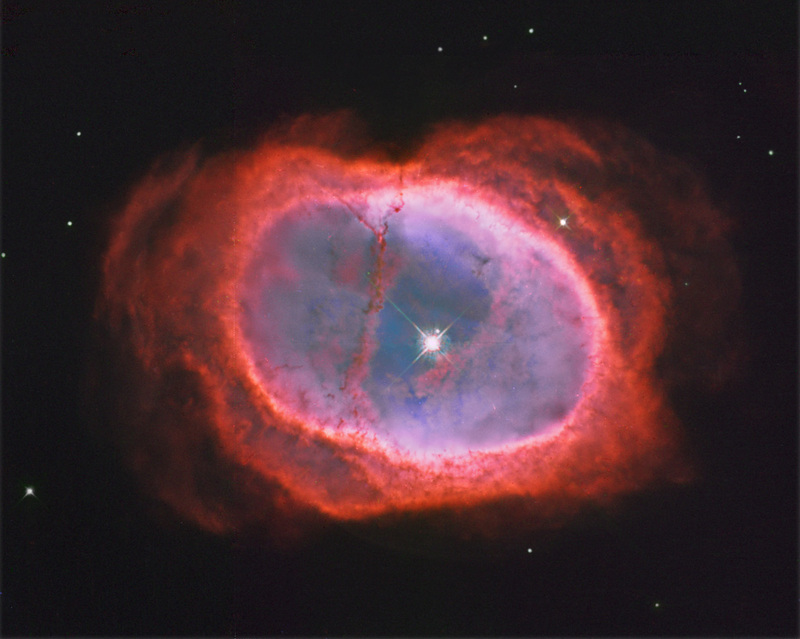 Images of planetary nebulae are included on my Pinterest board Nebulae.